Typically these incidents happen on the road, but the Anthony Davis saga isn't typical. Can't blame Pelicans fans for souring on their star big man. His trade request killed their season. But I honestly think that their future won't be as dim as many think. 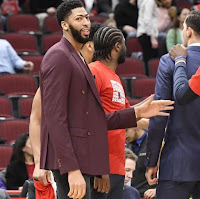 They should have about a 25-35% chance at a top 4 pick in the draft and based on the Lakers deadline offer of Lonzo, Kuzma, Ingram, Hart, Zubac, two first round picks and two second round picks, they should receive a king's ransom for Davis in the summer. My guess is the Celtics will top that offer, which is pretty obscene in and of itself. I don't have too much of an issue with Davis flipping the bird either. He must be receiving a ton of vitriol since the trade request from fans. Seems like an isolated incident. Still obviously would take him on the Celtics as long as the trade bounty isn't crippling.